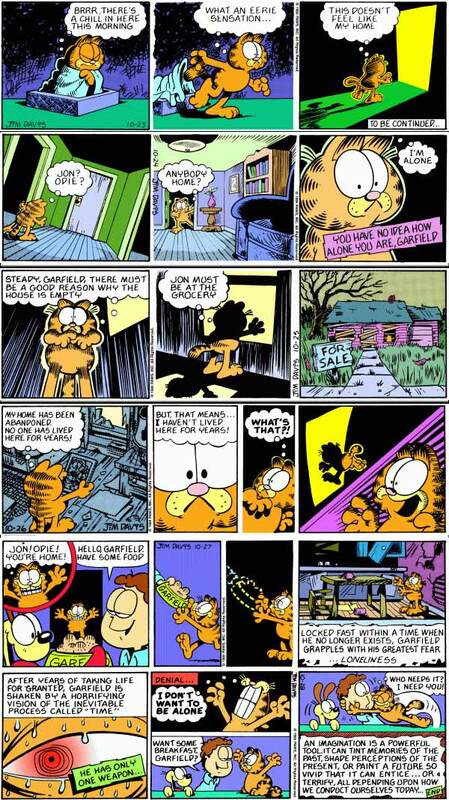 In case you hadn’t noticed, we are currently in the midst of a “Garfield” renaissance. Despite the best (worst?) efforts of Bill Murray in two recent feature film abominations and Jim Davis himself (or at least the staff of anonymous artists that he chains to easels each week while he sips mai tais and screams “When in doubt, lasagna!”) in the still active comic strip the ole’ orange feline is seeing a pop cultural resurgence. I, like many who grew up in the ‘80’s, once loved the character without the slightest bit of irony. I thought he was hilarious. (To my credit, I never found “Beetle Bailey” funny though. Not once.) I bought the books (up through “Garfield Eats More Stuff: His 27th Book!”), read the strip in the Sunday paper, and even got a not-too-cuddly, yet beloved stuffed Garfield in my stocking when I was eight which I have to this day. And, speaking of dolls, I remember how thrilling it was just to see a stuffed Odie attached to the bow of John Cusack’s sailboat in the classic “One Crazy Summer” and also how subsequently infuriating it was to watch with horror as the evil Teddy Beckersted’s cohorts cut off his tongue. But, we all get older and wiser. One day a “Far Side” or a “Calvin & Hobbes” comes along and suddenly renders your once beloved strip as obsolete. And suddenly, you find yourself walking right past the Garfield books in the “Humor” aisle of Waldenbooks to pick up a “Bloom County” collection instead. It happens. It’s how it goes. That said, there are two locations currently making waves on the intertube that have rekindled the deadened embers of my affection for Garfield, Jon Arbuckle, Odie and the rest of the gang; Two websites independent of each other which equally and obsessively chronicle the sublime and, dare I say it, metaphysical underpinnings of Jim Davis’ life’s work. If you’re going to head over to their site after this I’d recommend getting yourself a nice, snug pair of Depends ‘cause if you’re like me you’ll be sitting in front of your computer screen for a long time enjoying it. And you also probably have some issues with leakage. Here’s a helpful hint on that: Creatine is great for building lean muscle mass, but you’re just tempting fate by following it up with the Olestra-laden chips. Come on now. Use some sense! I, for one, won’t look at the Sunday paper the same way again. For instance, what would happen if you took everyone else out of each “Cathy” strip except for Cathy? Oh, wait, I guess you get the same thing. So, there you go. Let the Garfield revolution begin! Man, that was a good one, right? Ahh…Hungarian Garfield never disappoints.